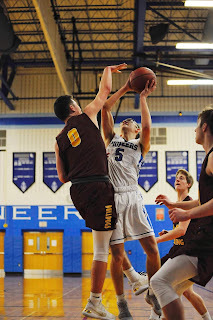 Pioneers defeat Northeastern 64-36 on Monday. Tonight, the boys look to even the score in Etown rematch. 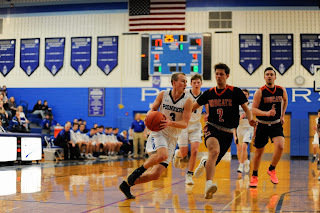 On Monday, Lampeter-Strasburg Boys basketball team bested Northeastern, 64-36. The Pioneers host Elizabethtown tonight at 7 pm. In their previous outing, Etown bested L-S 47-44. The Pioneers are looking for a big W this evening to secure a better place for the state championship bracket. Enigma Weekend Edition Poem: "All We Ever Do"
All we ever do is write in Streams of words, letting the thoughts Flow from our minds, creating experiences, things To feel, things to remember. The trouble is that The experiences won’t always be remembered when they’re clouded by a Sea of other words – other experiences. This year’s musical is The Secret Garden. The cast is working hard to make this a musical to remember. We took the first couple of weeks just listening and learning the music then we started to stage the production. The Secret Garden is a story about Mary, a young girl who survived a cholera outbreak in India. She travels to Britain to live with her uncle, Archibald Craven, who lives in a haunted house upon a hill that is filled with spirits. Since her aunt Lily’s death, Archibald has pushed away everyone he loves and left his son, Colin, alone to bear the guilt of Lily’s death upon his crippled shoulders. When Mary discovers her aunt Lily’s garden, she is determined to make it thrive. The spirits from the past warn and welcome her to the garden as Mary brings life and happiness to the house and garden of her uncle. The cast has been working hard, and every day we improve on the little things that will make this musical the best our school has done! 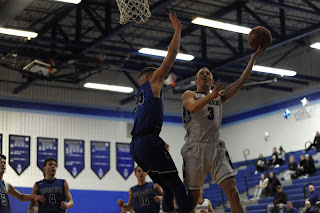 Monday's game started with the Lampeter-Strasburg Boys Basketball team taking an early eight-point lead of 8-0. Big Springs answered with their own eight-point run to first tie the game and then take the lead halfway through the second quarter 17-15. Head coach Ed Berryman must have given a passionate halftime pep talk because the Pioneers started the third quarter with another 8-0 run and eventually completely overran the Bulldogs to win the District 3 Class 5A opener 50-37. Also helping the Pioneers win was their 10 3-pointers. On Thursday at 7 pm, the Pioneers will host the seventh-place ranked Muhlenberg (16-8) in the quarterfinals. Enigma Weekend Edition Poem: "East Side"
We sat down to talk Can we be here forever? Do we have anything in common? Anything at all? If we do then let’s be friends if not, we will still become friends because We have been for years Put Our friendship and Minds together To make this world better so It will grow just like us! In this installment of In My Own Words, Faith Keene recounts her first indoor color guard competition. The day has come for our first competition, and we're performing "To Wish Upon a Shooting Star" show. The team arrives at the school early. We need to tape the underside of the mat before leaving. We do two quick runs through the show before leaving. Halfway through the first run Mr. Vineate, a helper from the marching band, gives us a pep talk. While our coach starts the van to warm it up, we started to fold the floor in what we call a "show fold." Getting the mat into the van was the hardest part, and the wind didn't help us at all. Soon we got the mat, cart, and the flag bags in the van. Finally, we are our way to Penncrest High School. During the 90 minute ride, the girls and I start Dutch braiding our hair. We attempt to do our makeup but the bumpy Pennsylvania roads don't help the process. Enigma Weekend: Take a Risk and Take a Hike. Explore the Outside World Up Close. A lot of people's favorite pastime is hiking, but how much do they really notice. Sometimes we just need to slow down and take in the world of the small. This is a poem that I wrote about stopping and taking in the world of moss. Realize the beauty of the world. A luxurious hotel for microscopic invertebrates. Farther than you could ever dream. The game started off with the usual starters Beau Heyser, Luka Vranich, Payton Cunningham, Carson Garver, and Berkeley Wagner. From the tipoff, L-S was not looking so great. In the first minute, the Pioneers would be down five before they would score their first basket of the game making it 5-2. Late in first quarter, number 50 on Garden Spot took a bad fall on his ankle and was out for the rest of the game. The rest of the first half was back and forth of both sides, but at the buzzer, L-S was leading 22-14. On Monday the Lampeter-Strasburg Wrestling team had their final home meet of the season. The Section 2 champs did not disappoint. They defeated Warwick in nonleague play 52-17. In this installment of In My Own Words, Faith Keene shares her freshman experience participating in color guard. Being a member of your schools color guard is stressful sometimes, but it is a lot of fun when you get used to it. Color Guard is where you incorporate flags, sabers, rifles, and dancing into a show you learn by using drills to figure out where you stand and move from set to set. Color Guard can be stressful when you first start because you don't know anybody and trying to remember the basics like feet position, jazz walks, and jazz runs. Color Guard can also be stressful because you try to remember the work you learned last practice and doing it with the drill. Color Guard is also sometimes stressful because you have to remember the drill and work and do it with the marching band and try not to hit the band members while running around the field doing the work. Last weekend on Saturday, January 26, the Lampeter-Strasburg Indoor Track participants had the opportunity to go to the Franklin & Marshall High School Invitational. 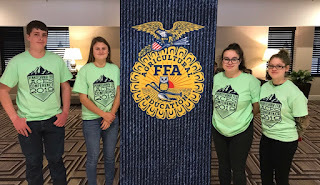 It was a great way to practice skills and compete against many other students around Lancaster County and nearby states. Over 1,000 high school students attended competing in throwing, jumping, sprinting, and distance. Twelve girls and fourteen boys competed for Lampeter-Strasburg High School ranging from freshman to senior class. Our own L-S Boys won the overall title for the entire meet for men's competitions. Ezra Mellinger placed first in a total of three competitions: long jump, 60 meter dash, and 200 meter dash gaining a total of 30 points for the team. Another great highlight from the day was girls pole vault. Kati Platt, a freshman, competed for the first time clearing 6'1".